Craig, who plays banjo and guitar, and sings bass, in our band, Swappin' Lies, has a new piece of equipment. If I'd taken notes, I could tell you what it's called, but I didn't, so we'll cut right to the chase: It makes recording music, even when you're talking about four people and twice that many instruments, really, really easy. So we did! We recorded an entire Cd, of music both original and otherwise. If you have a Cd full of music, it's nice to have art for it, and I got to be the one who came up with it. I owe a great deal of that to Barbra Sundquist, who very graciously allowed me to use one of her pieces as the basis for my own. 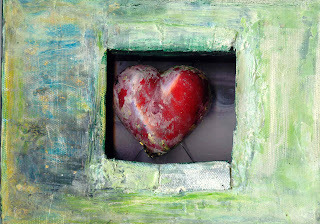 I want to show off Ms Sundquist's artwork first, called "Watching Her Heart". It purely won mine. 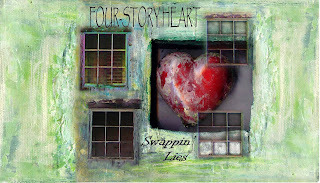 Lorna, who sings alto/soprano and plays guitar and banjo, was the one to come up with a name for the Cd itself: Four-story Heart. As soon as she emailed the suggestion, I got a picture in my head of an old building, old windows, possibly with our faces looking out. A heart with windows in it was also a possibility. I went looking for pictures of hearts, which is what I was doing when I found Barbra's website, and "Watching Her Heart". It shaped my focus. I had started a search for the windows I'd need when I realized I already had them, on the buildings I'd photographed just a few months ago. ( Decrepit ) Once that popped into my head, the rest was just a matter of (hours and hours!) of PhotoShopping. I used LightScribe to burn the image on the Cd's themselves. LightScribe does only black and white, but the disks come in different colors, so depending on the disks you buy, you'll get black and a color. I chose the gold ones, which give a sepia look. First things first: I do believe in Santa Claus. I don't know if he's in some other dimension, or is a real saint, or what, but I believe. Having said that, this entry is about my grandchildren's belief. My four-year-old darling, Michaela, recently wrote a letter to Santa. She said that she and her little sister thought he was wonderful, and they loved him. She said they had looked and looked for him, but couldn't find him, so they would have to visit him and the North Pole. Sweet. Very shortly after that, their six-year-old brother, Justin, told them Santa didn't exist. Micky wrote a new sentence to the end of her letter: "But you're not real, so never mind. I won't be seeing you." Well, that just about broke my daughter's heart, but what was she going to do? In the course of the conversation, December told Steve what Justin had told the girls, and they formulated a plan. 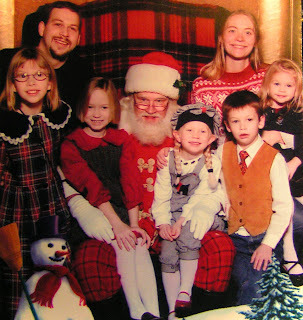 Yesterday, Jeff and December took all five kids to the mall to see Santa. 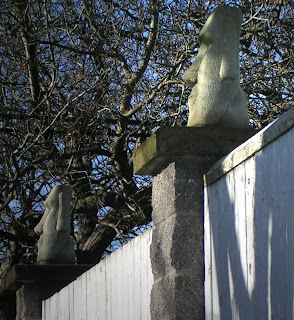 When he came back from his break, they were all lined up, sitting on the bench at the head of the line. Now, Steve is absolutely the personification of the best Santa you ever dreamed up--no padding needed, snow white beard and hair, endless patience, and a very real love for children. He came striding up, as all the kids in line cheered and called, "Santa! Santa! ", and when he turned to see who was first, exclaimed, "Well, hello, Caitlin! Great to see you!" Caitlin, who is eight, gave a start, she was so amazed at his knowing her name, and her jaw dropped. Then Santa turned to Justin, "And Justin! Great to see you, too!" While he chatted with the other three, Caity and Justin clammered, "How did he know our names? How did he know our names?" Soon he had them all gathered around him, talking about how good they'd been and how much they'd grown. He asked them if they'd liked the flashlights he'd put in their stockings last year. "Mine got lost inside the wall," Astoria said. "Oh, I remember that," said Steve. "That was a shame, wasn't it?" One of the others said the flashlights had burned out very quickly. "I know," said Santa. "I felt really badly about that. I really thought they'd last a lot longer than they did." Then he turned to Justin again, saying (he knew this from a phone call December had made the day before), "Justin, I know you've really been wanting to pull my beard." He stuck his whiskered chin out. "Well, here it is. Give it a pull." Justin did. He gave it a good, hard pull, and when it didn't budge, his jaw dropped again and his eyes opened their widest. That's when the photographer snapped the picture. Justin looks like he's in a total state of shock. Before they all left, Santa asked if it would be all right if he had a word with Justin, privately. December and Jeff said yes, and they all moved a bit away, as Santa knelt down and said, "Justin, I know you're having a hard time believing in me right now, so this is just between me and you. Don't tell your parents. Don't tell your sisters. When I come fill your stocking on Christmas eve, I'll put a marble in yours." He held his hand out to our wide-eyed boy. "This is what it will look like," Santa said, and centered in that white-gloved palm was a marble. "That way, when you find the marble you'll know I've been there." Santa, at our house to visit, shortly before Christmas, also left one of his gloves at our house. He told the children he would do that, and they knew to ask if I found it when they came over on Christmas day. So what happened after that? Christmas day, they came over to visit. I had draped the glove over one of the fireplace screen doors, and when the kids asked if I'd run across "anything unusual" told them I hadn't, but I'd been pretty busy. Imagine the excitement when they spotted the glove! They ran to the adults, all gathered in the dining room, exclaiming over it, and then realized our son John is about the same size as Santa-Steve, and promptly made him put the glove on, so they could stroke his hand, to see if it really was Santa's. They were sure they'd remember the texture of it, especially with a large hand inside. They clustered around John, each touching the glove, sometimes two of them at a time stretching towards it, marveling. "It's his! It really is! Santa left his glove, just like he said he would!" That was part A. Part B? The kids hadn't been at home that morning to get their stockings. When they got home, the kids all rushed for the fireplace and their stockings, but Justin was especially intense. He grabbed up his stocking and upended it, dumping all the contents. There, in the toe, last thing out, just like Santa said, was the marble. Justin gasped. "It's here! It's here!" December craned her neck to look. "Uh, yeah. You got a marble." "No, you don't understand. You don't understand. I...it's...the marble...Santa's real!" You'd think that would be enough, wouldn't you? This story actually spans another Christmas, though. December and Jeff took the kids to see Santa-Steve the following year, too. Again, he knew their names, and talked to them about things that had happened during the year. This time, the kids had each colored a picture for him, and written Thank You on each, signing their names. They gave them to Steve, but did you know store Santas aren't allowed to keep anything the children give them? As they got ready to leave, Steve slipped the pictures into a Christmas coloring book, and gave it to December. Christmas eve, December took glitter pens and wrote on the back of each picture, in her fanciest handwriting, "You're welcome! Love, Santa," and put each one in the appropriate child's Christmas stocking. I suspect that someday there'll be a nineteen or twenty-year-old man telling his friends they're mistaken, that he actually met Santa when he was a little boy, and that he has irrefutable proof of his existence. I'm still baking! It almost makes me glad of the snow, except that I know if we hadn't have been snowed in these past...how many days is it, now? 4? 5?...days, I'd have simply been more diligent, and gotten my baking done by yesterday, when the first holiday get-together was scheduled. 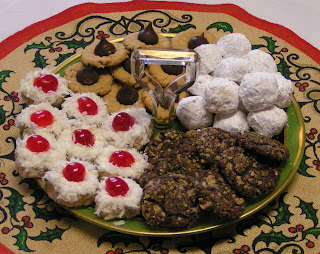 As it stands, I still have two or three kinds of cookie I'd like to bake, on top of the five that are done. Last night, I invented a new one, and I have to share it. It is s-o-o-o yummy! It's also what I call a "cheater" recipe, one you don't make entirely from scratch, so it's also quite easy. Preheat oven to 350 degrees F (176.6 degrees C). Mix finely ground coffee beans into cake mix. Cut butter into cake mix until it resembles coarse crumbs. Stir in egg and coffee until well blended. 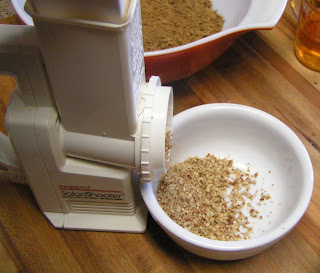 Mix Heath bits and chopped walnuts together. 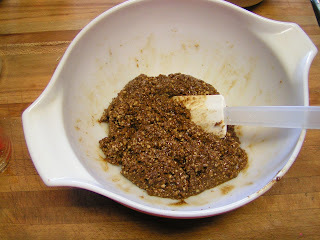 Form cookie dough into 3/4" balls, and roll in the candy/nut mix, pressing gently to embed the candy. * Place on ungreased baking sheets about 2" apart. Bake 12 minutes. Let cook on baking sheet two minutes, then remove. *Further note: I played with the easiest way to shape the cookies and found that pouring a layer of the candy/nut mix onto the pastry sheet, and then rolling lumps of the dough into "snakes" worked nicely. It embeds the candy in the dough while you work. Cut the snakes into 1/2"-3/4" lengths, and gently push one cut end into the candy. It will look like a little almond rocca bar. Stand it on end on the baking sheet. Mix butter, sugar, and vanilla* thoroughly. 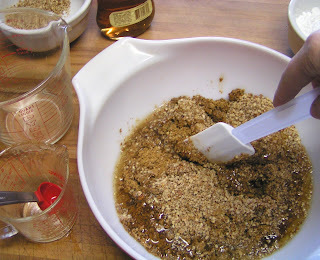 Add the flour, and sprinkle the salt over the top, to aid even mixing. Blend in. Add nuts. Chill dough. Preheat over to 400 degrees F (204 C). Form dough into 1" balls. Place on ungreased baking sheets. (The cookies don't spread, so you can put them quite close together.) Cook 10 to 12 minutes, until set but not brown. While still warm, roll in confectioners' sugar**. Cool. Roll in sugar again. *Substitute 1 teaspoon vodka for the vanilla, if desired. ** Easier: Put confectioners' sugar and baked cookies in a sealable plastic bag. Zip bag shut and gently tumble cookies to coat with sugar. Our third cookie is one we've had at Christmas literally for as long as I can remember. Mama might remember when she first baked them; all I know is it was back in my childhood sometime. Add water and beat until fluffy. Sift together flour and salt, and add to creamed mixture. Stir in oats until blended. Form dough into 1" balls, and press thumb into center of each to make small depression. Place on ungreased baking sheets. (The cookies don't spread.) Bake 20-25 minutes until set, but not brown. Cool cookies completely. Frost the cookies. It isn't necessary to get frosting into the center depression. 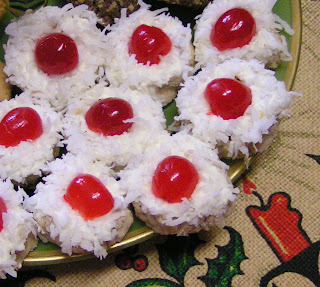 Dip the frosted cookie into shredded or flaked coconut, pressing lightly so the coconut sticks to the frosting. Place a marachino cherry half into the center of each cookie. This is another "cheater" recipe of my devising. Mix all together. Form dough into balls, and mash with a glass that has a prettily patterned bottom, or do the traditional crisscrossed fork thing. Bake cookies at 350 degrees F (176 degrees C) for 8 to 10 minutes. 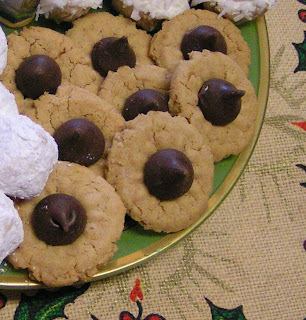 While cookies are still hot, lightly press a chocolate kiss into the center of each. Don't have peanut butter cookie mix? This is the world's easiest cookie. On top of that, if you can't have flour, you can still eat these cookies, because they don't have any. Honest. I kid you not. Mix all ingredients, and bake as above. It hasn't seemed to me, as I thought about it the last couple of weeks, that we have that many Christmas traditions worth writing about. That may sound a little cynical, but it isn't really. 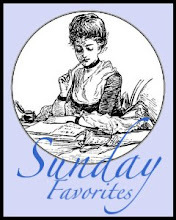 It's just that the traditions our family has are shared by so many other families around the country, and some of them, probably, around the world, that anything I could write would just be a few hundred more words in a heap of similar verbiage. But Diane's Mom (lost that link!) had a wonderful entry on one of her family's traditions, the annual Christmas tree ornament, and that sent me straight to my camera, and then to my tree. I love this tradition. I first heard about it maybe 48 years ago, as a young 4-H'er. My 4-H group had met, as usual, at our leader's home for our monthly meeting. It was the holiday season, and the Christmas tree stood in the living room. At some point during that meeting, she explained to us that she always got each of her children and her husband an ornament each year. The tree was full of lovely ornaments, which clearly had meaning to her and her family. I made up my mind, then and there, that when I grew up I was going to do the same thing. True to my resolve, I bought or made an ornament for my husband and myself each year, and then for the children when they came along. Our tree was wonderful! I never considered that someday the kids would grow up and take their ornaments with them! They all married within a year and a half of each other, and on top of that my husband and I divorced. That first year after the kids had all gone, my tree looked bare indeed. I saw this wonderful Santa with a dear friend, Linda Golaszewski, and loved it, but couldn't afford it. Dear person that she is, she bought it for me later. I nearly wept when I unwrapped it, and it has place of honor every year. One of the things I love is fairies. You'll find them all over my house, although they mostly reside in the kitchen and my office. 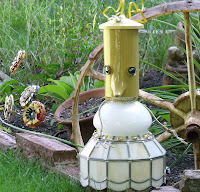 My husband, on the other hand, collects bird cages, and has, over the years, populated most of them with flocks of artificial birds of every description--blown glass, ceramic, quilled metal, mirrored forms, wood shavings, even felt. At Christmas, all things winged flock to our tree, and nest or flutter in the branches. This baby fairy usually sits on a shelf in the kitchen. The lovely pillow-like blown glass ornament is a memento from a fellow cast member in the Christmas Revels, Quinland Porter. I think of her every time I unwrap it, and each time I see it on the tree, and smile. She is our Queen, whatever role she plays! A poignant little ornament, purchased in remembrance of our little grandson, who never saw his first Christmas, but tried so hard to live! This is (don't laugh!) the fairy that most reminds me of myself. My Mom has a photo of me running in just that pose when I was little. Hanging lower, on the right, is the little Northlander I found as a reminder of the Revels Northlands show. I had a lovely time as Queen Witch Lohi in that one, and still find myself singing in Swedish, Polish, and several other languages of Northern Europe. The music of those lands simply perched in my heart and never left. 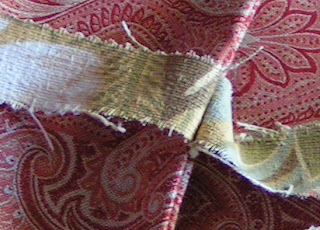 I made a whole flock of these fabric angels one year, about thirty years back, in many colors, and with many facial expressions. 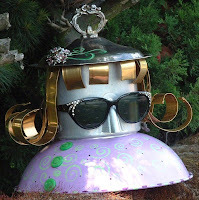 They were great fun to make, and my Mom still poses hers across the mantel, amongst garlands of greenery. 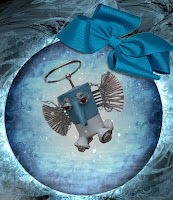 The little blue and white fairy was a gift from one of my stage "daughters", Claire. She was only eight at the time, and made it herself. I never put it away. During the rest of the year it hangs from a cabinet knob in my office, to remind me of her. Don't you just love that pompom caterpillar? My ex brought it home from work one day, and it was love at first sight for me. And Jack Frost there? What a find he was! Stuck in a box of random Christmas stuff at an estate sale, and priced at a dollar. I still smile at my good fortune. Next to him, a pressed paper Lucia girl, another reminder of Northlands traditions. 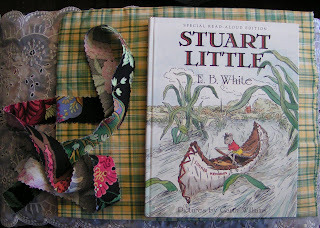 I did the little ceramic mouse back when the girls were very little. They still have theirs, too. The apple fairy was something I couldn't resist at an antiques mall, and the star with the snowman...ah. That is special. Auntie Jewel brought that craft to one of our annual week-long craft get-togethers, a (usually) spring tradition. This is our first Christmas without her. Another fairy, and a fool who reminds me of a dear, and hilariously funny, man who has played The Fool many times, in many shows. The medieval boy was another score--$1.99 at the Goodwill. His foot was broken. I used jewelry findings to cap both his shoes, and presto! Better than new! The "Greetings" ornament is one I made my husband for our first or second Christmas as married folks, which would be sixteen or seventeen years ago. I do love the fairies! The blue and white bear was a gift from my old music partner, Paul. 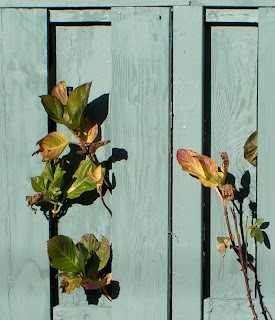 He gave it to me at least twenty years ago, knowing how I love blue and white. He is still a cherished friend, and though he lives far away now, we write, and hope to play and sing together again one day. One style of the birds DearHusband collects, these made from narrow strips of metal, and decorated with beads and tiny jewels. I thought they were so unique and wonderful! I embroidered disks of pink satin for each member of the family one year, including my parents, disguising the letters of our names in the flowers. Somehow, when the ornaments were distributed to their new homes, my ex got mine, and I got his. If you use your imagination, you'll see that the flower "spells" T-I-M, reading from top to bottom. Another of my husband's birds, probably the only blown glass cockatiel I've ever seen, and well-loved for its subtle coloration. Last, at least of the ones I couldn't bear to leave out, and certainly not least, the little angel that used to top my mother-in-law's tree each year. It won't fit on the top of our tree, so it always stands as close as it can get. I love her, wherever she lights. 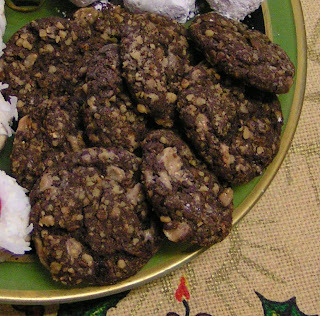 One of the things I love is cookies, so at Christmas, I make sure there are plenty of them to be had, always baking at least six kinds, and sometimes more. I used to start in October, putting the dough together and freezing it until December, but now all that baking just get squooshed into the week before Christmas. 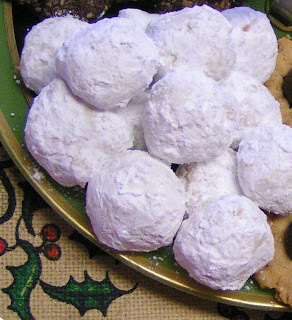 I was supposed to do the rum balls Monday, so they'd have a week to sit, and be ready for the first family get-together on the 22nd, but I forgot. Well, the flavors won't be quite as blended and melded as they might have been, but having *hic* tried them immediately after putting them together this *hic* afternoon, I can say probably nobody will be complaining. Crush the gingersnaps. 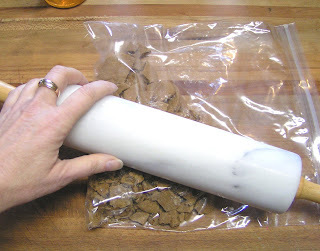 I used a rolling pin and plastic bag, my usual method, but after I did the pecans with the Salad Shooter, I was kind of slapping my forehead. Next time, I'll used the Shooter for the gingersnaps, too. After crushing the gingersnaps, grind the pecans. Use your Salad Shooter. Or whatever works. Mix all the ingredients together, except for the powdered sugar, until the dough forms a sticky mass. 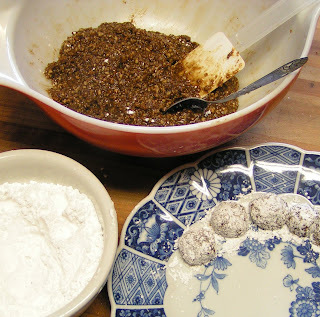 Pinch off bits of dough and form into balls, and roll balls in the powdered sugar. Let the rum balls sit for a week. My cook book doesn't say what sort of container to use for that, but I'll probably put them in a plastic container with a paper towel on top. This was the first time I've tried this recipe, and the cookies are yummy, but the dough seemed much too gooey to me. 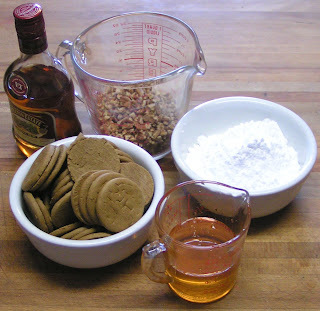 I ended up crushing another cup's worth of gingersnaps, and adding them and another 1/2 cup of the ground pecans, too. You may or may not have to do that, probably depending on the brand of gingersnaps you use. Admission: Lame title. Just couldn't think of anything better. 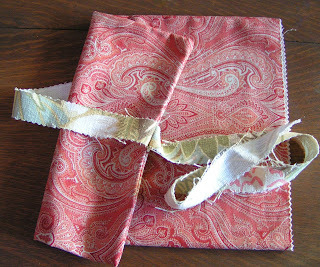 I have more gift wrapping to do, but my new fabric gift bags make it so simple! Pretty, too. So I'm sharing, and again letting the news out: These bags will be in my Etsy store in due time, but let me know if you want some, and I'll make "due time" arrive more quickly! Start with one of my gift bags. Tie the streamers in a bow. Done! 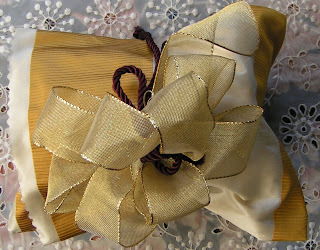 Fold the top down, bring the streamers up around the gift, and tie a bow. Done! 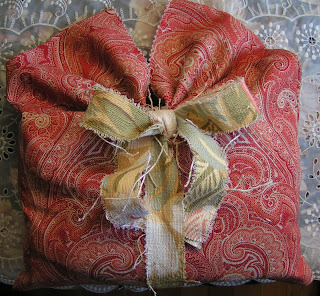 I'm wrapping gifts again on this day of snowflakes and ice, so there'll be more gift wrapping to show off later! 'Tis the season to wrap presents! It's a chore that never seems very chore-like to me. In fact, if I start early enough not to be rushed, it's quite a pleasant activity. Have I mentioned I have new gift bags? 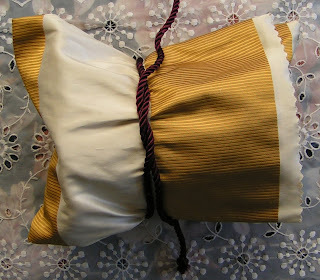 I've been making them from oversized fabric swatches from the various interior design houses here in town. 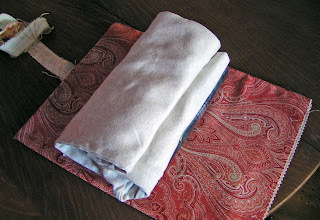 Today I wrapped gifts in two styles of the bags, and decided to put up small tutorials about it. I will have both fabric bag styles on Etsy later; in the meantime, if you're interested in them, just drop me an email or a comment or something! I chose a wine bag for the first gift, which wasn't a bottle of wine. It wasn't a bottle of anything. 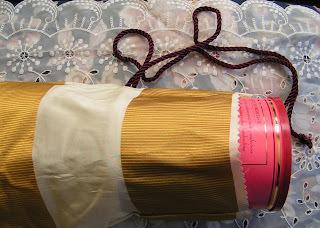 It makes me think naming a bag "wine bag" just because a wine bottle fits well in it is a bit too limiting. 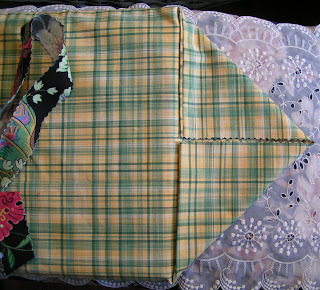 Fold the top of the bag down, and tie the cord around the gift. 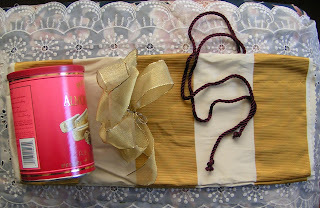 If you like, tie on a bow, arranging the loops and cord ends prettily. 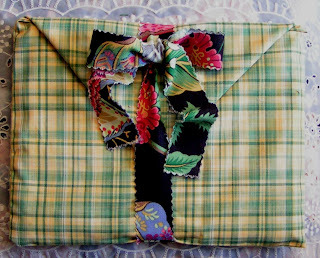 It's about as easy a gift wrap as I've ever done, it's green, being from recycled materials, and hopefully the recipient will reuse the bag, which makes it even more green. 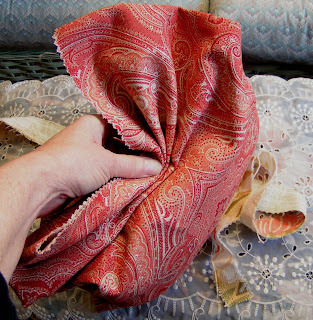 Easy, green, and almost sure to be reused--that's a formula that makes me smile. Just one fence this Friday. 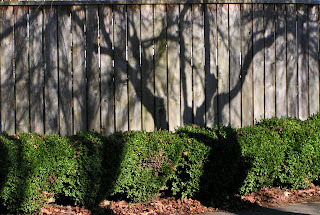 I had a fence in mind to photograph, but didn't get to it, instead spending the day at home, kind of disjointedly putzing around, waiting to hear if the chest pains Mama was having were a heart attack. She's in ICU tonight, with just one other patient there. They're keeping a close watch on her, but the doctor doesn't really know what's causing her distress. Two of the five enzymes that indicate a heart attack are present in her blood, but not the biggest tattle tale enzyme they look for. Hopefully, she'll be home tomorrow. 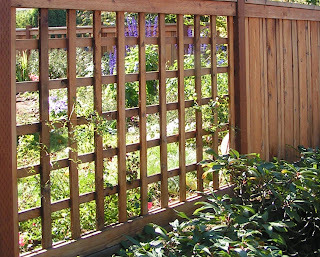 I loved the view of a garden in bloom through the lattice "windows" of this fence. Isn't it pretty? 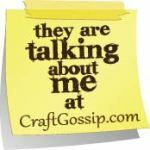 The EtsyBloggers Team is featuring SpottedCowSoaps this month. She's also known as Ms Moo. I hope I never see one. and Ms Moo because my nickname for one o my granddaughters is Mickey Moo. Ms Moo creates a lovely-wonderful line of soaps and scrubs, with most everything looking good enough to eat, although wash clothes haven't been on the menu for me yet. But scrubbies? 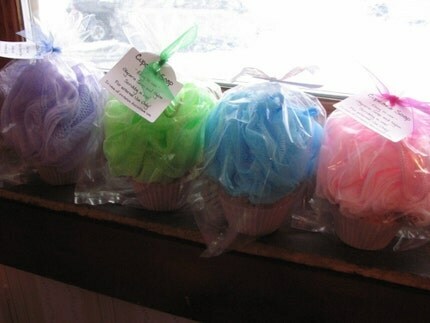 The way she packages them, on top of handmade soaps to look like frosting on a cupcake? Maybe you wouldn't actually put them in your mouth, but you'd sure have them to your nose! Below is an Etsy mini for Ms Moo's store. You can click on any image and be taken right to that article, and from there poke around and explore. (Can you say "Stocking Stuffers"?) There's something for everyone, guaranteed! 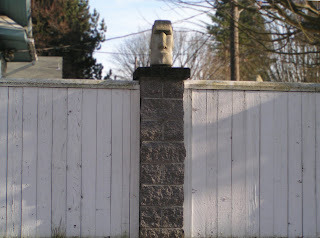 I didn't get the Friday Fence Post posted yesterday. Was going to, but couldn't find the cord that connects the camera to the computer. I found it easily enough this morning, oddly enough. Must have been tired, huh? 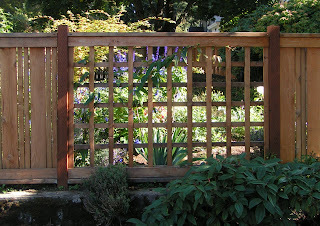 But I did find a really cool fence! 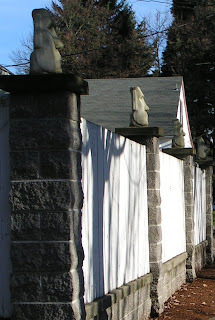 Someone has created their own version of Stonehenge, right here in little ol' Portland, Oregon. Too much fun altogether. NEW! COFFEE POT PEOPLE "On Vacation"
I've been working on a new project, one I'm excited to share, not to mention crow about. The photographs have all made it onto the front of cream-colored blank note cards, and will shortly be available in my Etsy store. And although I haven't scanned the final product into my computer yet, I am (was there ever any doubt?) going to share the pictures right this very minute. This barefoot boy refuses to tell me where he found the fountain! That's it for now! I have another fifty or sixty yet to do, so these vicarious vacations will undoubtedly keep me occupied for some time to come!